While campaigning in her district, the cops were called on a black lawmaker as she was meeting voters door to door. Rep. Janelle Bynum represents the 51st District in the Oregon House of Representatives, which encompasses Clackamas County, where she was canvassing a neighborhood when the police were called Tuesday. The Democrat was 1.5 miles away from her own home at the time, she said. The officer mentioned that the caller was suspicious because she was spending a lot of time typing at the end of driveways, Bynum said. 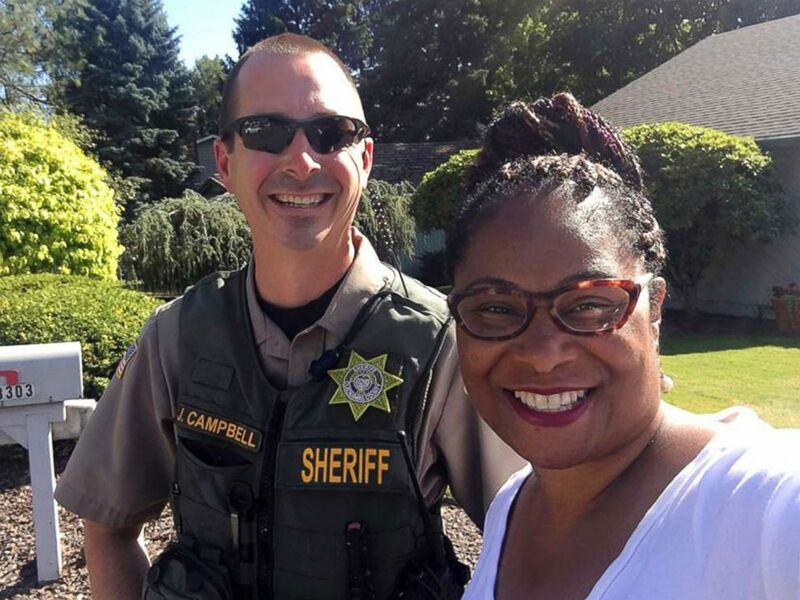 Oregon state Rep. Janelle Bynum poses with a Clackamas County Sheriff's officer after he stopped her in Clackamas, Ore., July 3, 2018. Bynum is running for her second term in office this fall and spends up to 30 hours every week campaigning by going door to door. The deputy allowed Bynum to speak to the person who made the 911 call on the phone, she said, and the caller apologized. But the cell reception was poor so the conversation was broken and brief, she added. Bynum told ABC News that she hit the “law enforcement lottery” with the deputy who responded to the 911 call, citing his professionalism and how he handled the situation. “I was glad I got caught doing the right thing,” she added.